• It is active or running when it is in the foreground of the screen (at the top of the activity stack for the current task). This is the activity that is the focus for the user's actions. • It is paused if it has lost focus but is still visible to the user. That is, another activity lies on top of it and that activity either is transparent or doesn't cover the full screen, so some of the paused activity can show through. A paused activity is completely alive (it maintains all state and member information and remains attached to the window manager), but can be killed by the system in extreme low memory situations. • It is stopped if it is completely obscured by another activity. It still retains all state and member information. However, it is no longer visible to the user so its window is hidden and it will often be killed by the system when memory is needed elsewhere. If an activity is paused or stopped, the system can drop it from memory either by asking it to finish (calling its finishO method), or simply killing its process. When it is displayed again to the user, it must be completely restarted and restored to its previous state. All of these methods are hooks that you can override to do appropriate work when the state changes. All activities must implement onCreate() to do the initial setup when the object is first instantiated. Many will also implement onPause() to commit data changes and otherwise prepare to stop interacting with the user. • The entire lifetime of an activity happens between the first call to onCreate() through to a single final call to onDestroy(). An activity does all its initial setup of "global" state in onCreate(), and releases all remaining resources in onDestroy(). For example, if it has a thread running in the background to download data from the network, it may create that thread in onCreate() and then stop the thread in onDestroy(). • The visible lifetime of an activity happens between a call to onStart() until a corresponding call to onStop(). 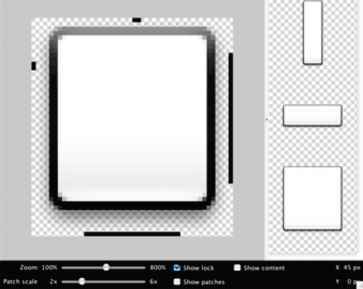 During this time, the user can see the activity on-screen, though it may not be in the foreground and interacting with the user. Between these two methods, you can maintain resources that are needed to show the activity to the user. For example, you can register a BroadcastReceiver in onStart() to monitor for changes that impact your UI, and unregister it in onStop() when the user can no longer see what you are displaying. The onStart() and onStop() methods can be called multiple times, as the activity alternates between being visible and hidden to the user. • The foreground lifetime of an activity happens between a call to onResume() until a corresponding call to onPause(). During this time, the activity is in front of all other activities on screen and is interacting with the user. An activity can frequently transition between the resumed and paused states — for example, onPause() is called when the device goes to sleep or when a new activity is started, onResume() is called when an activity result or a new intent is delivered. Therefore, the code in these two methods should be fairly lightweight. The following diagram illustrates these loops and the paths an activity may take between states. The colored ovals are major states the activity can be in. The square rectangles represent the callback methods you can implement to perform operations when the activity transitions between states. previous state, if that state was captured (see Savina Activity State, later). Always followed by onStart(). Called just before the activity becomes visible to the user. Followed by onResume() if the activity comes to the foreground, or onStop() if it becomes hidden. Called just before the activity starts interacting with the user. At this point the activity is at the top of the activity stack, with user input going to it. Always followed by onPause(). Called when the system is about to start resuming another activity. This method is typically used to commit unsaved changes to persistent data, stop animations and other things that may be consuming CPU, and so on. It should do whatever it does very quickly, because the next activity will not be resumed until it returns. Followed either by onResume() if the activity returns back to the front, or by onStop() if it becomes invisible to the user. Called when the activity is no longer visible to the user. This may happen because it is being destroyed, or because another activity (either an existing one or a new one) has been resumed and is covering it. Followed either by onRestart() if the activity is coming back to interact with the user, or by onDestroy() if this activity is going away. Called before the activity is destroyed. This is the final call that the activity will receive. It could be called either because the activity is finishing (someone called finish() on it), or because the system is temporarily destroying this instance of the activity to save space. You can distinguish between these two scenarios with the isFinishing() method. Note the Killable column in the table above. It indicates whether or not the system can kill the process hosting the activity at any time after the method returns, without executing another line of the activity's code. Three methods (onPause(), onStop(), and onDestroy()) are marked "Yes." Because onPause() is the first of the three, it's the only one that's guaranteed to be called before the process is killed — onStop() and onDestroy() may not be. Therefore, you should use onPause() to write any persistent data (such as user edits) to storage. Methods that are marked "No" in the Killable column protect the process hosting the activity from being killed from the moment they are called. Thus an activity is in a killable state, for example, from the time onPause() returns to the time onResume() is called. It will not again be killable until onPause() again returns. As noted in a later section, Processes and lifecycle, an activity that's not technically "killable" by this definition might still be killed by the system — but that would happen only in extreme and dire circumstances when there is no other recourse. When the system, rather than the user, shuts down an activity to conserve memory, the user may expect to return to the activity and find it in its previous state. To capture that state before the activity is killed, you can implement an onSaveInstanceState() method for the activity. 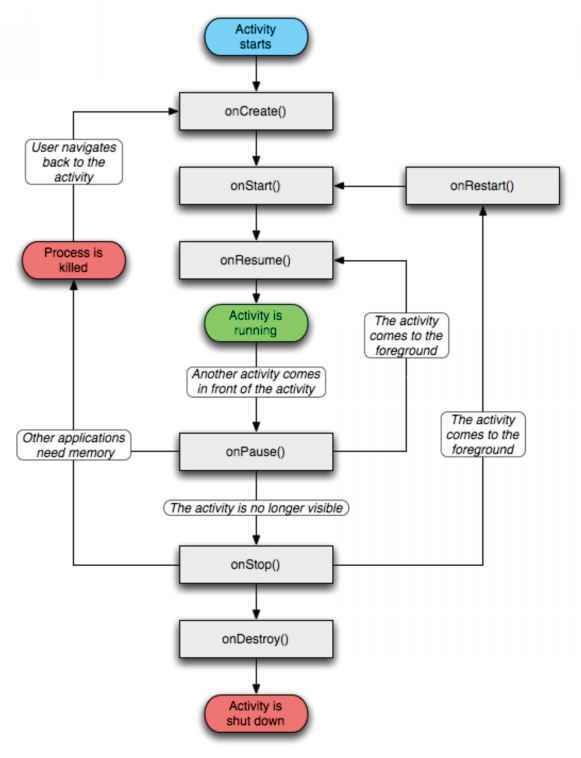 Android calls this method before making the activity vulnerable to being destroyed — that is, before onPause() is called. It passes the method a Bundle object where you can record the dynamic state of the activity as name-value pairs. When the activity is again started, the Bundle is passed both to onCreate() and to a method that's called after onStart(), onRestoreInstanceState(), so that either or both of them can recreate the captured state. Unlike onPause() and the other methods discussed earlier, onSaveInstanceState() and onRestoreInstanceState() are not lifecycle methods. They are not always called. For example, Android calls onSaveInstanceState() before the activity becomes vulnerable to being destroyed by the system, but does not bother calling it when the instance is actually being destroyed by a user action (such as pressing the BACK key). In that case, the user won't expect to return to the activity, so there's no reason to save its state. Because onSaveInstanceState() is not always called, you should use it only to record the transient state of the activity, not to store persistent data. Use onPause() for that purpose instead. When one activity starts another, they both experience lifecycle transitions. One pauses and may stop, while the other starts up. On occasion, you may need to coordinate these activities, one with the other. 1. The current activity's onPause() method is called. 2. Next, the starting activity's onCreate(), onStart(), and onResume() methods are called in sequence. 3. Then, if the starting activity is no longer visible on screen, its onStop() method is called. What lifecycle method is implemented to do the initial setup when the object is first instatiated?